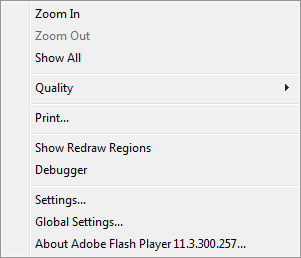 Can I remove or hide the Flash context menu? The answer is no, you cannot. 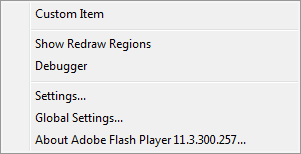 There is no way to hide the context menu, and although you can remove some items like the print option, there is no way to hide the “Settings…” or “About Adobe Flash Player” items. But lets go over what you can do. 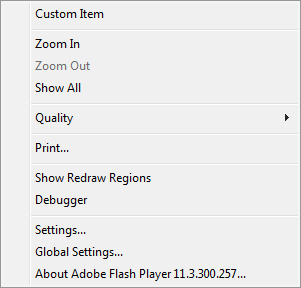 * Menu item select event handler for the custom context menu item. * @param event The event arguments. The ContextMenuEvent instance includes several useful properties including contextMenuOwner which is a reference to the ContextMenu that the clicked item is a child of, and mouseTarget which is a reference to the object in the display list which was right clicked to display the context menu. Here we use the builtInItems property to hide all of the built-in items except for the “print” and “quality” items. So instead of setting the contextMenu property directly on the stage, we are instead creating two different ContextMenu instances and applying them to two objects, objectA and objectB, which are already on the stage. If you right click on objectA, you should see contextMenuA appear, and if you right click on objectB, you should see contextMenuB appear. Extremely simple, and extremely powerful! So there you have it. Context menus are incredibly easy to manipulate in ActionScript 3, although there are some limitations that you have to be aware of. If you have any further questions, please feel free to leave a comment below and I will try my best to answer it.